New Debussy headphones boast OLED touchscreens and AI smarts | What Hi-Fi? The Debussy brand is owned by the Funky Sound Studio, a startup whose members include a number of experienced audio engineers and designers. At the heart of all three models is Iris, which Debussy is calling a 'smart sound system'. Iris is the system behind the headphones and includes a powerful processor, an OLED touchscreen display, USB-C charging, and both voice and gesture controls. You can use Iris to stream directly from services such as Tidal, Spotify and Qobuz over 4G, Wi-fi and Bluetooth, or you can store music on the 32GB of built-in storage. Iris also includes Debussy's Sound Signature Technology (SST) and Accurate Natural Sound Technology (ANST) with the headphones in the range boasting 20 hours of battery life. 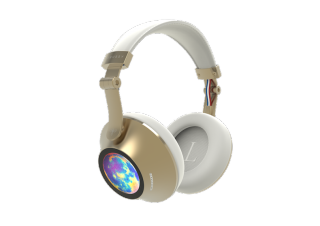 Nathaniel is a design named after Nathaniel Baldwin, the inventor of the very first pair of headphones. It's a high-end over-ear design, available in a trio of luxurious finishes: Midnight Blue (with silver plating), Dark Shadow (with dark chrome) and Gold Ruby (with gold plating). All versions feature a combination of leather and velvet fabric, while the interior of the headband shows music from Debussy's famous Suite Bergamasque. You'll be able to pre-order these headphones from March 2018. Clair De Lume (pictured above) brings a more elegant and minimalist look to the range, and is available in both over and on-ear versions with a choice of six different finishes. Finally, the third pair (which wasn't on display at CES 2018 was Prelude, a $500 model which is due to launch as part of Debussy's Kickstarter campaign in early 2018.